I've discovered that "Seeing the point in Jim Soorley" is a recessive allele of the "Soorley on Sunday" gene (SOS gene). Readers of Humbug! Online might recall a post at the New Year where I asked the question: "What's the point in Jim Soorley?" I couldn't see it. However, Jef considered Soorley to be an inspiration. My newborn son, Hayden, has also found a point in Jim Soorley. I reached this conclusion thanks to Hayden's recent arrival and his burgeoning sense of intellectual adventure and use of humour to make a point - much like his Father and his Father's Father. 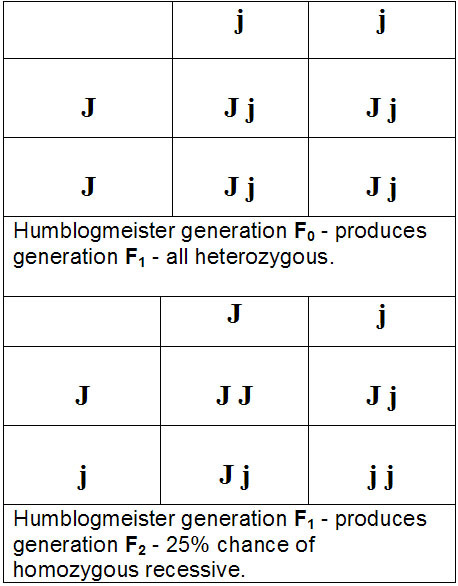 Hayden is the newest generation of Humblogmeister (generation F2). He found a point to Jim Soorley. Given I was unable to do so (and neither can my wife) he must be homozygous for the recessive allele (can see a point) of the SOS gene. There was a 1/4 chance of this happening. 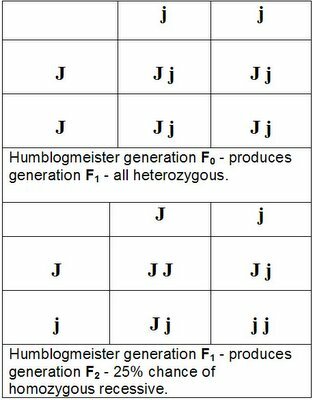 Jef (generation F0) is the same as Hayden, homozygous recessive, but his wife (my Mother) is most likely homozygous dominant - as none of my siblings could find any point in Soorley and neither could she. As far as I can figure, this is the only possible explanation for "being able to see a point in Jim Soorley" skipping a generation. Oh, I forgot to say what point Hayden found in Jim Soorley.